Giuliano della Rovere was elected to the office of Pope on 1st November 1503, taking the title of Julius II. Despite the corruption, double-dealing and other very worldly activities of which he was doubtless guilty, Julius’s reign would leave some remarkable legacies that have lasted to the present day. Giuliano, born in 1443, was the nephew of Pope Sixtus IV, after whom the Sistine Chapel in Rome is named. Giuliano gained hugely from the relationship, being made a cardinal in 1479 and given charge of nine bishroprics and numerous abbeys, all of which produced a considerable income. He also managed to father three illegitimate daughters, one of whom, Felice, was destined to become a wealthy and powerful woman in her own right. When Sixtus died in 1484, Giuliano expected to be elected as pope in his place, but was outvoted by Innocent VIII who only lasted for eight years. At his second attempt Giuliano was defeated by Alexander VI, the notoriously corrupt Rodrigo Borgia, whose bribes were larger than those that Giuliano della Rovere could muster. Giuliano was not willing to take this rebuff lying down, so he left Italy in order to join the French King Charles VIII in a military campaign to invade Italy and depose Pope Alexander. The attempt failed and Giuliano was forced to seek sanctuary in France after Alexander ordered his assassination. Alexander died in 1503 and Giuliano once again put himself forward for election. He failed again, this time at the hands of Pius III, who had the advantage of being neither a Borgia nor a della Rovere, but the disadvantage of being in such poor health that he died after less than three weeks, thus giving Giuliano his fourth shot at being pope, this time successfully. After a lifetime of striving for the top job, he was nearly 60 when he eventually achieved it. 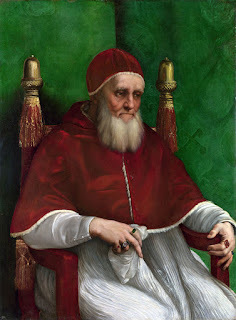 As pope, Julius II had to defend his throne against his enemies. The first of these was Cesare Borgia, son of Alexander, who was soon expelled from Italy and died four years later fighting in Spain. Julius then moved against the Bentivogli family who governed Bologna as despots. The city state was subsequently annexed to the Papal States in 1507. Julius also defeated the powerful Venetians (in alliance with France and the Holy Roman Empire) in a dispute over two towns that they had taken from Rome, and then persuaded Venice to join him in an alliance to expel his previous allies, the French, from the territory they held in Italy. He therefore showed himself to be both a clever diplomat and a fearsome military leader, who greatly strengthened the temporal power of Rome by expanding the borders of the Papal States far beyond where they had been during the Borgia period. But despite all his success as a warrior pope (the last of that particular line), Julius is best remembered for being the pope who laid the foundation stone for the new St Peter’s Basilica, which was completed a century later, and commissioning Michelangelo to paint the ceiling of the Sistine Chapel. Julius II was a pope who did nothing by halves. The plans for St Peter’s were criticised at the time as being far too grand and guaranteed to cost much more than could be afforded (the critics were to be proved right). The pope’s relationship with Michelangelo was notoriously frosty, with the Sistine Chapel project being one that Michelangelo would have loved to turn down if he could – he was a sculptor, not a painter. Julius had previously commissioned a statue from him that took a year to make but which Julius ordered to be smashed as soon as it was completed, just to show who was boss. Everything that Julius commissioned, including the design for his own tomb (also from Michelangelo) was done for the glory of Pope Julius first, and God a somewhat distant second. However, Julius was also a shrewd judge of many things, including artistic genius. He may have hated Michelangelo personally, but he knew that he was the man for the ceiling job, despite having another genius painter in his employ, namely Raphael. The result is there to this day, for all to see. Julius died of a fever in 1513, long before his tomb was completed. Indeed, the original design was greatly curtailed and – ironically enough – Julius’s remains do not lie within it. The tomb (which incorporates Michelangelo’s famous statue of Moses) is in the minor church of St Peter in the Vatican, whereas Julius was re-buried under the floor of St Peter’s Basilica near the monument to a later pope, Clement X. If one imagines popes to be saintly and devout men whose only concern is the well-being of the Church they lead and the people that it serves, that is certainly not the impression one gets when reading about the popes who reigned during the period in question, Julius included. However, he was responsible for some remarkable artistic endeavours that have survived to the present day.